Welcome Vincent fans.. You should know that the Vincent is a legend among vintage motorcycles.. The Rapide, Black Shadow, and Comet are among the rare birds of motorcycling... 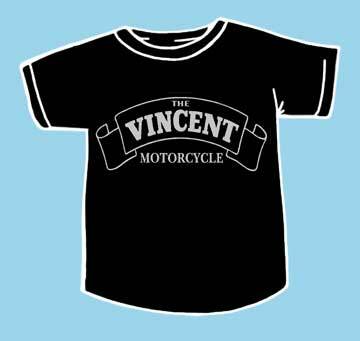 This Vincent logo covers all the bases..Screen printed on 1st quality (BLACK ONLY) T shirt made of 100 % cotton ..